Roofers build or repair sloped roofs, using roof tiles, slates, shingles and metal materials to form waterproof surfaces. Prepare drawings and specifications of the roof. Read and interpret drawings and specifications. Take necessary safety measures, for instance using scaffolding and traffic barricades. Remove roof materials such as tiles or slates and demolish (parts of) the roof construction. Repair (parts of) the roof construction. Prepare the roof for tiling by applying roof insulation, roof rafters, lead, etc. Cover roof with tiles, slates or related materials using various techniques. Measure and cut roofing materials to fit, e.g. around vents, chimney edges and the hips and valleys of the roof. Install roof fittings, such as gutters, pipes and roof windows. Conduct periodic maintenance of sloped roofs. Techniques used to form the upper covering of a building according to specific materials such as ceramic tiles, wood shingles, slate, metal, concrete of plant stalks. Form and fix the pieces, usually made of metal, that make the joint between the roof and the masonry or brick work, and prevent water infiltration into the structure. Remove faulty or otherwise unneeded roofs. Unmount roof elements and accessories such as rain gutters and solar panels. Protect the structure from the elements while the roof is being removed. Roll out mats of roofing material, often bituminous asphalt, to cover flat or low-pitched roofs. Apply the felt layer first if required. Make sure there are no gaps so the roof is weatherproof. Firmly attach the layer to the structure. Inspect the condition of an existing roof. Check the state of the weight-bearing structure, roof covering, insulation, and accessibility. Take into account the intended purpose of the roof, including any accessories to be installed. Inspect the roof or facade cladding to assess its general state and identify any damage, recommend and perform maintenance and repair work such as fixing broken shingles, replacing flashing, clearing debris and securing the gutters. 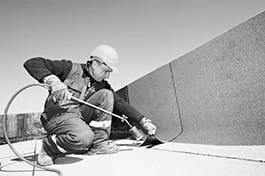 Take measurements, cut the desired length of gutter, assemble gutter pieces to form the corners using adhesive substances and screws, drill a hole for the connection with the vertical gutter, establish the height of the gutter, fix the horizontal and the vertical gutters to the walls using brackets and screws. Build the structural elements of wood flat or pitched roofs. Lay rafters to provide strength and battens at regular intervals to account for lateral forces and attach any covering. Back the weight-bearing elements with panels, such as plywood, and insulation material. Check whether a wood element shows signs of rot. Aurally inspect the wood by testing what sound it makes on impact. Check for visual signs of rot. Select the appropriate pieces and, if necessary, prepare them for fixing by cutting, sawing, trimming the edges. Lay interlocking roof tiles of various shapes and materials. Fix the tiles to the battens judiciously, and take special care of the verges, ridges and hips.